I have had my Fiddle-leafed fig for about six months now. In the beginning it was very pretty and I had read about not overwatering it so I was only watering at once a week. it was doing well until it had an issue with fungus gnats from some potting soil I had from another planet. I used the fungus gnat spray and I was finally able to get rid of the fungus gnats. 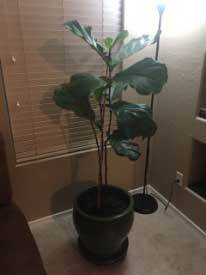 After that though my Fiddle Leaf fig started getting a lot of brown spots on it and losing leaves. I then began to Question: if I was under watering it because of continued spread of brown spots. I started watering it 2 large cups of water once a week. It has since grown three new leaves from the top branch. The bottom branches are all bear though. Is there any way I can encourage growth on the bottom part of the branch? There are a number of issues here that you probably are not aware of. You didn’t mention light, but Fiddle-leafed Figs have to be located indoors right in front of and close to a sunny window that is left completely uncovered throughout the daylight hours. If this plant does not receive enough light, then it cannot support as many leaves. 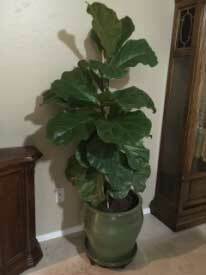 Your Fiddle-leafed Fig was moved into a larger pot with lots of extra soil added to it. The soil you added not only introduced the fungus gnat larvae, but the excess soil makes it much more difficult to water properly and the plant more prone to root rot. Dry brown patches on leaves can be caused by inadequate light or under or over watering. New leaf growth is almost always at the tip ends of stems and lower leaves that fall off are not replaced unless the stem is pruned all the way back to the place where you want to see new leaf growth. 1. Move your plant to a very sunny indoor location. 2. Scrape off and remove all loose soil that was added to the top of the original rootball. Any soil not in immediate contact with roots should be discarded. This will help with future gnat problems and it will also allow the soil around the roots to dry out more frequently and prevent root rot. 3. After the excess soil has been removed, water only when the top half-inch of soil is very dry. Then, add just enough water so that it reaches that same level of dryness again in about one week. You will have to experiment a bit to determine just how much that is. 4. To keep the plant from getting too tall, pinch out new leaf growth at the stem tips as it emerges. This will help keep it fuller and more compact, although it is unlikely to cause new growth to emerge on low portions of the stems.